One of the Micro-Grant recipients is the Lansing Bike Co-op, a Lansing-based organization that empowers our community through education and access. The Lansing Bike Co-op received the Micro-grant fund to host two courses with a special emphasis on serving the low-income community. 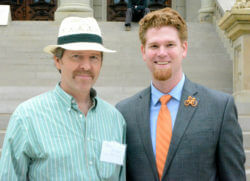 Thank you to Jeff Potter for telling their story. “We put the word out for a month with posters and social media. 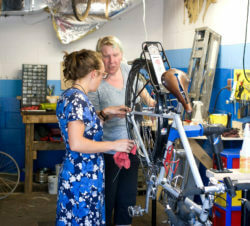 Then in July we offered a 4-session course in Basic Bike Repair. We served a full capacity of 12 students, 6 of whom took advantage of the low-income scholarship option that was available thanks to the LMB. Students ranged in age from 20’s to 50’s and genders were split about 50/50. We took a month off for recruiting before the September course and all 18 sessions were fully booked, on behalf of the LMB scholarship. Our format is designed to make the most of our small shop space. Each student selects whether they want to attend the weekly evening classes on Tuesdays or Thursdays. This fits well around school or work. A “small bites” approach also helps with student retention, since it’s only once a week. Each of the five instructors only teach one topic, making the course very manageable for the Co-op to offer. Several assistants also help during the hands-on portion of each session. Each session starts with an hour of instructor demonstration where students see the subject being worked through in front of them. The next hour is hands-on, where each student works on their own bike or a shop bike. The hands-on experience is another aspect that the LMB Micro-Grant made possible: We used a portion of the funds to purchase several work-stands with tool-sets so each student could work on a bike. Previously, not every student got the chance to actually practice all the skills being taught. ‘I found the class to be fun, informative, and incredibly empowering. It isn’t every day you get to learn to independently repair your own bicycle. This class was amazing!’ –Mackenzie M.